According to the American Diabetes Association, diabetes is a disease in which the body does is not able to produce or properly use insulin. Insulin is a hormone that are bodies need to converts sugar, starches and other food into energy that we need for daily life. Although both genetics and environmental factors such as obesity and lack of exercise appear to play a role in having diabetes, the cause of diabetes continues to be a mystery. There are about 23.6 million children and adults in the United States or 7.8% of the population ho suffer from diabetes. While there are an estimate of 17.9 million who have been diagnosed of diabetes, there are also 5.7 million people who are unaware that they have diabetes. And example of how diabetes affects our bodies is diabetic foot wounds. Individuals who have diabetes suffer circulatory disorders that create inadequate levels of oxygen to support the healing of wounds. These wounds present major complications for modern health care and especially with the foot as it is a common site of infection. In Canada, there is an estimated 25% Canadians with diabetes who develop foot complications and 1 in 15 end up having a limb amputation during their lifetime. Is diabetes a hopeless case? What could help in the cure for diabetes and wound healing? The answer to the first question is that diabetes is not a hopeless case, the second answer would be oxygen. Oxygen is one of the most powerful and versatile agents available to the modern medical practitioner today. The therapeutic use of oxygen under pressure has been used to assist in the healing of wounds for almost 40 years. This therapeutic use of oxygen under pressure is called hyperbaric oxygen chamber therapy (HBOT) and in the following paragraphs are its specific biological actions which can enhance diabetes and wound healing. HBOT can be used successfully in hypoxic or ischemic wounds such as diabetic wounds,venous static ulcers, failing flaps and grafts, refractory osteomylitis and necrotising soft tissue infections. In wound healing, hypoxia delivers an insufficient supply of oxygen which prevents normal healing processes. HBOT combats clinical infection such as gas gangrene by directly acting on the anaerobic bacteria, enhancing leukocyte and macrophage activity while potentiating the effects of antibiotics. HBOT provides the oxygen needed to support and stimulate wound healing. HBOT is safe, non-invasive and a non-toxic therapy. HBOT is also very much accessible. 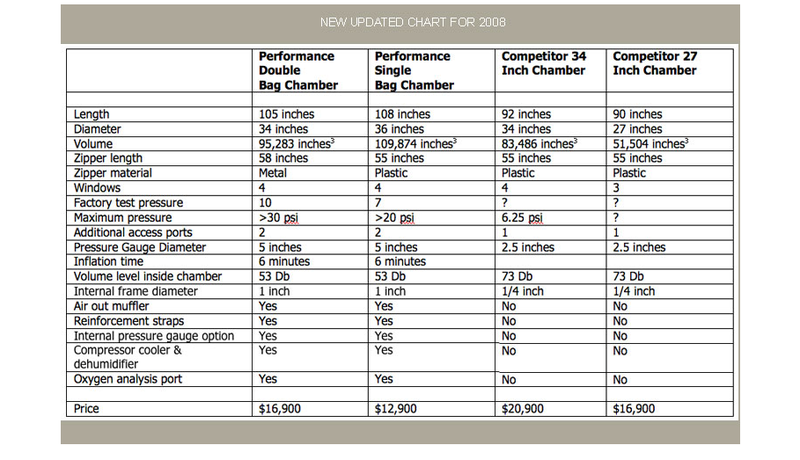 Single bag hyperbaric chambers are sold at $12,900 and double bag chambers are at $16,900. Single bag hyperbaric chambers can also be rented at $2,000 a month and $2,,675 for double bag chambers. Both hyperbaric bag chambers measure over 34 inches in diameter and 105 inches long. These chambers can easily fit both adult and child at the same time. Start spreading the word about HBOT and start helping lives as well.